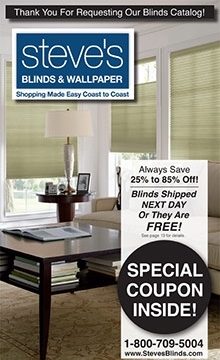 Your complete blinds catalog, delivering the best blinds at the best prices, from 25% to 85% off retail. Savings will be applied automatically at checkout on the Steve's Blinds website. Extra 50% coupon is found inside the Free Steve's Blinds Catalog.